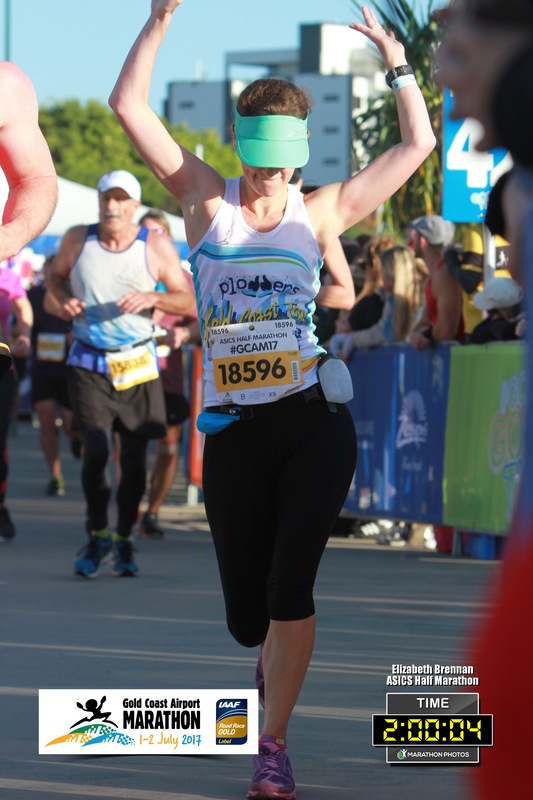 In July I ran my first half marathon. It was a big ‘thing’ for me, having started running in February. While it’s tough, running is joyful for me. It’s distracted me from sewing and everything else. If I wasn’t running… I was thinking about running. I hoped to finish in under 2 hours, 15 minutes… I finished in 2 hours, 4 seconds. 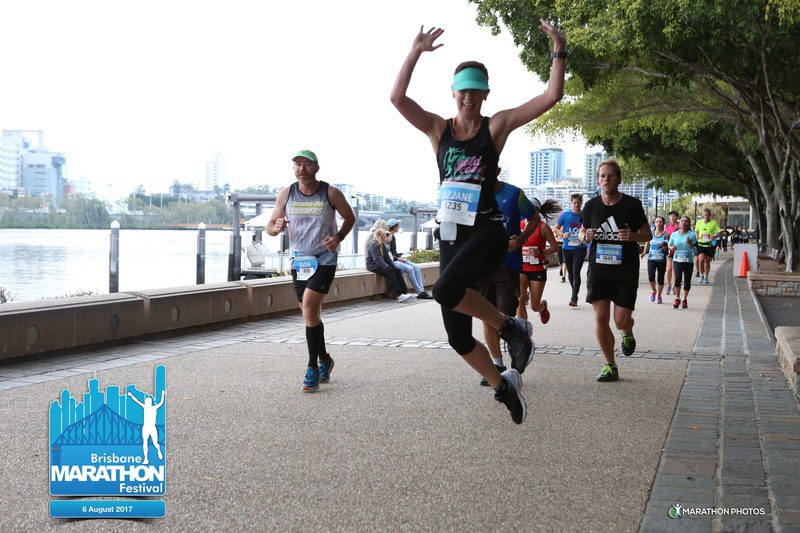 So I entered the Brisbane Half Marathon at the beginning of August – those 4 seconds annoyed me. I loved this course and finished in 1 hour, 58 minutes & 33 seconds. The course was a little long & Strava tells me my new half marathon ‘personal best’ is 1 hour, 57 minutes & 10 seconds. Satisfying & still plenty of room for improvement as I fell apart a bit in those final kilometres. Running is funny like that, some kilometres are just so so tough even when you know you are so close to the end. About 12kms into the 21.1km course and obviously feeling great! 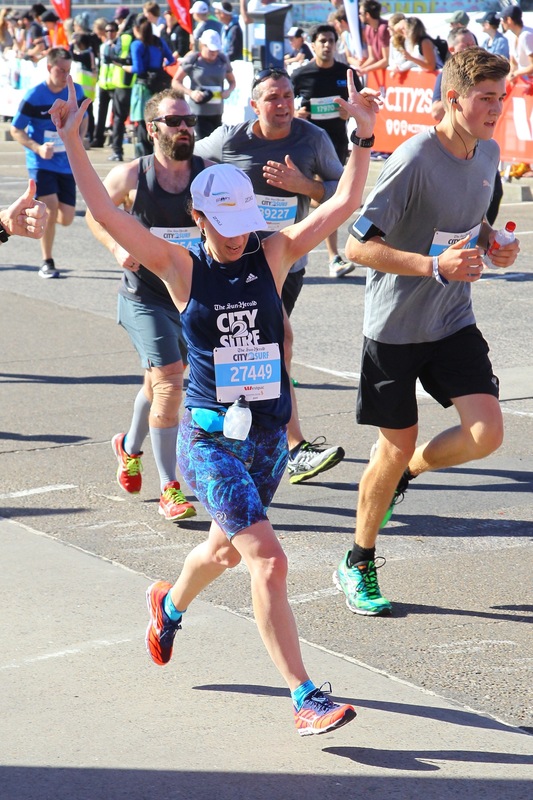 The following weekend, I completed the famous Sydney City 2 Surf. A 14km run from Sydney city to Bondi Beach. With over 67,000 participants, this is a MASSIVE iconic event – and a tough one. I finished in 78 minutes, surprising myself with my refusal to ‘give up’ even when I desperately wanted to and ran in the last kilometre at 4.40 pace. I finished in the top 9% of female competitors and my age group. Airborne & just relieved it is over! Just three days later, my life took a dramatic turn. Long story short, late on Wednesday 16 August I was hit by a hockey ball in my right throat and it dissected my carotid artery. A life threatening injury. I had no idea. With no visible bruise, swelling or damage, I just carried on with life. 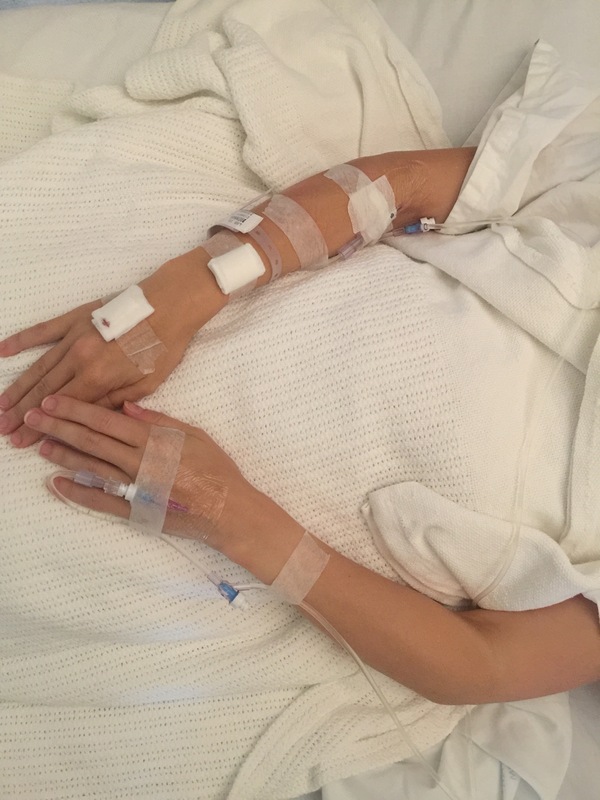 I felt progressively worse as the days wore on & when I finally did get what I thought was ‘just an annoying swollen gland’ reviewed, I was immediately admitted to hospital and airlifted to Sydney’s Royal North Shore Hospital for review and treatment. The obvious concern & trepidation of all the medical staff told me one thing, I was in serious trouble. And so began the relentless days and nights of monitoring, tests, reviews and procedures to make sure this ‘thing’ didn’t claim my life. It’s been one of the most traumatic experiences of my life. To be confronted with my own mortality. Reality can be a very ugly thing and sometimes the only way out of a very difficult situation is to just keep moving forward one step at a time. Don’t think about the next day or week – just focus on getting through the next hour. Even when it is as scary as hell. I’m now in the neurological ward. I’m the patient who looks absolutely fine, is mobile, has all their cognitive abilities in tact yet is a bit broken on the inside. The medical team are incredulous I’m still here. Apparently I’m pretty tough… and extraordinarily lucky. I’ve been overwhelmed & humbled by the support, concern and love that’s rolled in for myself & my family as we get through this. And the amazing strength of my family as they have stood by my side as a very physical & emotional tsunami tore through my life. Needless to say I won’t be running for a very long time. I’m in hospital until they figure out the blood thinners to prevent clotting and to see if my body will heal itself. I’m hoping to be back home next week and to find my new ‘normal’. It’s going to be a long road to recovery and maybe the destination won’t be the same as where I came from. Things may never be quite the same again. I’ll never be quite the same again. But against all the odds, I’m still here. This entry was posted in Sewing Projects by sewbusylizzy. Bookmark the permalink. Such a story and an alternative outcome is unthinkable. When you first posted your injury my thoughts went to your daughters and how they were coping. I am glad that everyone is ok, but especially you. It is always good to be reminded about the value of life, so thank you and my thoughts are with you as you get through to a full recovery. Keep up the positive thoughts….I bet all the training you did has served you well I’m getting through this. All is not lost- you WILL be back! My thoughts are with you. A lady I don’t know but feel I do through your blog. Take the time it takes to recover. Life is precious. Shocking news – wishing you a smooth transition home, and into this next phase of your life, not what you had planned, but as you say, you’re still here! Best wishes again to you and your family. This is a shocking story and I guess a warning to all of us. I am so glad you got into the hospital when you did and that you are on the road to recovery now. It will only get better. Prayers for you and your family. I was so shocked about your accident, I am glad you got the help you needed, mend quickly but your sense of self has had an injury as well and needs TLC. I’m so glad you’re here to post this! I don’t know you but through sewing I follow you and wow, what a story. I hope your healing continues and is better than you hope. Thanks also for sharing the message about how precious life is. Sending good thoughts your way and wishing you a good recovery. We were just discussing this the other day, it’s called “living life in parentheses” (that description is from a book), and there is absolutely no way to prepare for it. You have been a lucky lady, and luck counts, too. Take good care of yourself and yours. I will be sending all good thoughts your way. Omg, you endured a terrifying experience. I am so happy that you are here writing about it and only hope for a continued, speedy recovery. You will feel better when you get to the comfort of your own home, both physically and mentally. Oh my gosh! I am so, so sorry! Sending you so much love and healing vibes. I work as an OT in a hospital and occasionally in the neuro critical care unit…being healthy and active is definitely a bonus in recovery. I hope you are home and able to get back to the things you love soon. We’re all rooting for you! One day at a time. All good thoughts heading your way for uncomplicated recovery. I always enjoy reading your posts.. but I was not excepting to read this! You are obviously a very strong person inside and out, and you will fight this and become even stronger! Thinking of you and your family as you recover! Wow. All my thoughts to you and your family. Stay strong! Sending you love and hugs and wishes for the speediest of recoveries. Hopefully very soon this will be just a story that you tell at boring dinner parties since it will all be a thing of your past. So sorry to hear that you are going through this. I have been through something like that myself (for different medical reasons). What I remember are the feelings of emotional disorientation, interruption, and fear. It can take awhile, but a feeling of “normal” will return. It’s an individual journey, but, yes, you are right, life changing. Or perhaps, life defining. Life is precious. You never know what tomorrow will bring. Take care and let your body heal. I am so glad you are. Still here that is. Being faced with your own mortality, as you say, cannot be easy, and you are way too young. Hang in there! All the best for your recovery. It is incredible how an accident can change everything. It surely is helping a lot that you are such a fit woman. I don’t know you in real life but I have followed you for some years now and I am so glad that you got appropriate help in time. I hope that you will recover soon! I am sending good thoughts to you, your family and your daughters! I believe I can understand. I lost my kidney function at 35, almost over night to a blood disorder.. I’m 57 now. Everyday is a gift. It had always been but I did not know it. 11 years of dialysis and two kidney transplants have taught me many lessons. Stay strong, I know you are so strong. Do what the doctors tell you. We each have a purpose. Some of us are just lucky enough to realize it. Thank you for sharing. Life is really a terrifying teacher, humbling you at every turn. I grasp from your words that you were in awe of your body, pushing yourself to new limits and smashing personal bests through running. Now I sense you’re in awe of your body just for being here, for pulling through, for being alive against the odds. In a weird way your body just levelled up, showing you reserves of strengths you didn’t know you had. Now you’re in a marathon of a different kind. I can only echo your sentiments, allow the people you love to really love you, to care for you, to catch you and carry you when you can’t get there yourself. Knowing your spirit that’s going to be hard. I’m not going through anything life threatening but I’m learning whole new lessons on allowing people in. I see the people around me looking and feeling helpless. I wonder what small comforts they as an individual might be able to give me and I ask it of them. I feel the energy shift when they get to be there in a way that’s meaningful to me. I hope you find that too. So sorry to hear that. Did not realise the seriousness of your situation. Praying for you and your family that you’ll make full recovery. And hopefully sewing & blogging will feature in your new normal too. Rest well, enjoy every moment of life, get well soon! Oh Lizzy, my thoughts are with you and your family. Wishing you all the best. Wishing for a full and quick recovery. So sorry this happened to you, but glad you are well enough to know how precious life is. Thanks for the reminder to live life to the fullest each day. Oh my God! What a freak accident. Wishing you a quick recovery and back to your old self as soon as possible. Can’t imagine how tough it must be being laid up when you feel so fit. Hope you do get back to running as you enjoyed it so much. Wow. Lizzy, I’m a nurse. When I saw “carotid artery dissection,” I was amazed you were still here and cognitively intact. You truly are one in a million. Vascular specialists are now going to be your best friends! But, I do know that a tremendous number of surgeons and physicians understand the allure and value of running, so I am certain they will have some idea of when you can safely resume running. In the meantime, allowing your body to heal itself, while slow and sometimes imperceptible, offers its best options for decreased complications and minimal side effects. Here’s to good sleep, diet, and judicious exercise! I’ll keep you and your family in my thoughts and prayers for healing. That is so scary and such a freak thing to happen. Wishing you all the best for your recovery and hope you can be home soon. What a terrifying experience. Best wishes to you and your family as you continue to heal. I’ll look forward to hearing that you’re back home sometime soon. Life is indeed precious. Sending big hugs and get well vibes. Recovery sounds like it’ll be a much slower place than you’re used too but hopefully you can adapt to the new short-term ‘normal’ while your body heals. Everyday your cells are working together with your body system to correct the clot. I went in for what was to be “a procedure” and a week off work, but I ended up with a hematoma the size of a foot and slowed bleeding behind it deep in the tissue. It could have gone either way. I was on my back for a month and a half and out of work for four months. I look back and didn’t realize the danger I was in because of the pain taking my thoughts. And it financially devastated me. But God was present and His plan was in play. In a way, I see now why it happened, why I needed to be placed in a position where I had to stay put and let other things occur around me to lead me towards change, to show me things while I laid there. I know you are in danger, but even as I write this, your body is correcting this problem. Keep writing through this. Let us know how you are feeling every day. On some days you will be more tired because its working harder; on others much better. Thank you for sharing your most important days of your life with us. You will be in my prayers. Oh my goodness, how scary! I will pray for you and a thorough recovery. I’m so sorry to hear about your injury, but so very glad to hear you’re still with us and hopefully mending nicely. Be kind to yourself – it’s so easy to get impatient when you’re a patient. 😊 I hope your daughters are doing well. If you’re looking for book recommendations, I loved A Gentleman in Moscow, A Study in Scarlet Women and Lab Girl (just to make it a short but eclectic list). Oh my gosh!! My heart just sank reading this. I know what it is like to be confronted with your own mortality and it shakes you to your core. That experience alone changes your perception on life and how you live it. I’m so happy that you are okay and in good hands for care. I can only imagine the pain of a hit like that to your throat as well. You are one tough lady. I look forward to reading a post that you are home. OMG, what a terrifying experience. I had my own medical ordeal last year which took three months to recover. What helps of course is having your family and friends for support. Wishing you all the best and a full recovery. You’re in my prayers. Frightening! Who would have thought! I am just glad you are, as you say, still here. Best of luck to you in the healing process. Wow! What a terrifying ordeal! Life in indeed precious. Wow, that is truly horrible! Wishing you a speedy recovery!!! It is truly terrifying how life can be so massively changed in a second. Wishing you as speedy a recovery as is possible Lizzy. I’m sure your base fitness level will help enormously with that. I’m glad that you are in hospital and making progress. I’m also grateful that the medical team is figuring out a plan for you going forward. I’m also thrilled with your positive attitude cause that helps so much in healing and getting better. You and your family will be in my thoughts and prayers! Thanks for sharing your story and sending you wishes for a speedy recovery. what a thing to happen, life can change in an instant and it sounds like you have lots of love and support to help you get back home to your family. How scary for you. I’m so pleased to hear you are on the road to recovery, even if it is a long one. If it’s any help to you, just under six months ago my sister in law had a massive heart attack and wasn’t expected to survive. Last Saturday she was guest of honour at her son’s wedding and lasted the whole day, enjoying every minute of it. I’ve read your blog so many times but never commented. But today I’m going to wish you maximum strength and healing.I’m grateful for your survival and I wondered about the strength your body now has because of the running, if that did not save your life.You are amazing, and your family must be amazing as well. I’m grateful for you. Thank you for sharing your story. I marvel at how the combination of good sleep, great food, judicious exercise (thanks Mary K!) , love and laughter promote deep healing. Wishing you a thorough recovery! I am a new follower of your blog. Yesterday, I was googling images and results for the Tessuti longline cardigan and read your review from a few years ago. Your intro truly spoke to my approach to sewing and obsession with pattern searches. while I am considerably older than you, I felt like I was meeting a kindred spirit! Then, after signing in as a follower, I went to your most recent post, and literally gasped when reading the onset of your traumatic health scare. I googled carotid artery injuries and feel I better understand what you wrote about treatment and prognosis. You will run again! I cannot relate to a carotid artery injury, but I do understand stenosis and longterm recovery from a dramatic neck injury. For my injury, 18 months is a typical timespan for recovery and finding your new normal. My activity of choice – besides sewing, is biking, Getting back in the saddle without putting undo strain on my neck meant raising handlebars a couple of inches. Rather than long-distance rides, I look forward to enjoying the same euphoric experience biking gives me with shorter rides. As you know – it’s all about attitude, acceptance, and modifications. Please, keep us posted on your recovery and the journey ahead. I will be reading your past blog posts and becoming better acquainted. Gentle hugs to you from halfway across the world, Lizzy! This sounds so scary. I’m really glad to hear you’re doing better than the doctors expected, and keeping my fingers crossed that your body will heal soon. Father God, you know about this injury, about this vessel, about this body. I ask that you would reach down and touch Lizzy. Give her great peace as she wades through this process. Give doctors wisdom beyond their training. Give her family the strength they need in this crisis. Help her to lean on you, on your great love for her, on your desire to be her trustworthy Father. Give here wisdom to see the potential in the new life she faces and to take deep joy in her life — even life in a hospital bed! Heal her body, I ask in Jesus’ name. What an impressive story! I wish you lots of strength, luck and power in the upcoming time. Hopefully your body will heal it’s self. Oh wow Liz. Sounds so scary. And you’re so right – things will return to normal. It will just be a different normal. One good thing is that probably because you were so fit you have improved your recovery time and outcomes immeasurably. My Mum was recently in RNS for 2 months with a broken back. She’s now up and about, off overseas for holidays. You’re in a great hospital with excellent staff. If you want me to drop into Tessuti’s and deliver some fabric to you to stroke and drool over, just say the word! So sorry you were hurt Lizzy! I hope all continues to go well for you and that you will have a speedy recovery. Thanks be to God for sparing your life! Life can change in a split second….. So glad to hear you are in the road to recovery as the alternative would be unthinkable…. Wishing you a speedy journey to total recovery! OMG how life changes so quickly a reminder for us all but so sorry it has to be you that is going through it. Take care, it will be a long road however your positive attitude will help your body heal itself. My thoughts are with you during your recovery. I’m so sorry to hear this. Sending you prayers and thoughts of strength! I will send prayers your way, for a speedy recovery !!!! So glad you are still here to tell this scary story. Wishing you all the best for a full and speedy recovery. Life is precious, indeed! Thank you for sharing yourself in so many ways. I’ve enjoyed reading your sewing posts for a long while. Sharing the triumphs of your running adventures was quite the lead for relaying your injury and brush with death. I wish you well in your recovery. We are all so much more vulnerable than we realize. Oh Lizzie, what a nightmare for you and your family. I hope you get to your best as soon as possible. What a turn. Life is precious and we have no control as much as we like to think we do. Not usually a commentator but I’m praying for you. Much love. What dreadful news. Oh no. Best wishes for a full recovery. No, life won’t be quite the same. That’s a loss that you have every right to grieve. Then what’s next? Remind yourself that you’ve picked yourself up before and found new energy, purpose & gratitude. You’ll do it again. Whether or not you heal fully, and if so whether you ever feel the same confidence in your physical invincibility, the new challenge is to make this brutal experience count for something good. It would be a waste of all this anguish if it doesn’t take you somewhere new. For now, gentle daily steps forward are plenty, and a willingness to accept help (ask for help?) more than you’re accustomed to. Let people rise to the occasion. Best of luck. This is such a difficult time for you and I am sorry. I am going to pray that you fully recover from this. That you will one day look back and see that because of His great love carrying you through all is counted as being Joy. I saw your posts about this on IG, and you have been in my thoughts and prayers. I’m so glad you were treated and I hope they adjust the meds and let you go home soon. I know from personal experience that life throws you curveballs at the damnedest times. Be well and heal quickly! I, and many others, are glad you’re sticking around to fight another day. It’s been great getting to know you again through your blog, IG, parkrun and running. We will eventually catch up for the coffee we haven’t yet got around to having. Thoughts and prayers are with your whole family. Life can change in a moment, that’s for sure. Getting in training shape may have saved your life; it will surely help you in recovery. Give yourself permission to heal, and to feel the full range of emotions that go along with that. We’re all pulling for you! Heal quickly! Feel better soon. I’m so sorry this happened to you. You’ll run again. Just not right now. 4:40 split is pretty damn fast. Good on you for making the top 9%. Just be kind to yourself now & take it easy. I’m so sorry this happened, how absolutely terrifying for you and your family. I’m thinking of you and hope recovery goes well. How awful! Wishing you all the best! Keeping you in my thoughts and sending best wishes for a speedy recovery from NYC! Life seams so predicable but it isn’t. You never know what’s behind the next corner. Wishing you all the best and a quick recovery. Blessings to you and your family. So glad the injury was detected in time. What a great start on recovery you’re making. And what a magic potion. Running has doubtless increased your store of fitness and endurance. Wishing you strength and a smooth and speedy recovery, free of complication. So shocked to read this. Thanks for sharing, your words show the depth of your inner strength. I only know you from reading your blog regularly and have never commented before, but wanted to send my best wishes for your recovery. One step at a time. Just one step at a time. Another silent but regular reader here. What a horrible experience! Wishing you a good recovery and fortitude for the inevitable annoyances of being caught up in the medical system, even when care is good. First of all you finished your half marathon! Yay, you’re a tough cookie… and that’s something that you’ve done: life goals -1! Second, gosh! I’m glad you’re still with us and I know you’re gonna be fine because … you’re a tough cookie! Everything’s gonna be alright, maybe different but alright … again I know it (I won’t make this about me but take my word for it) Get back on your feet soon! How are you doing now? What a frightening experience. I hopw you are ok and will soon resume running! Wishing you and your family strength and for you a full recovery. A terrible thing to happen to you. I wish you a speedy recovery. Lizzy, I’ve been enjoying your blog for years but rarely comment. I am so sorry you all experienced this trauma. I want to send my sincere best wishes and prayers for healing for you and your loved ones.